In the UK wasp nests only last for one year, but the queens work over winter to create new nests in the following year. Towards the end of the summer the workers can be very aggressive. 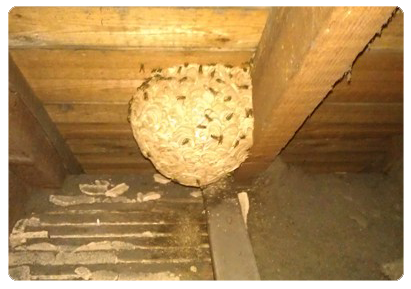 In the spring the new queen wasps, that mated the previous autumn, start to build their own individual wasp nest from chewed up wood. Each Wasp Nest is a series of horizontal combs completely surrounded by a paper envelope with concentric markings. Initially, the solitary queen has to forage for food, construct the brood cells and when the wasp nest is about the size of a ping pong ball she lays her eggs, feeds the developing larvae and defends the nest. When the first offspring emerge as adults they assume all tasks except egg laying. These sterile females are called workers and are noticeably smaller than the queen. The queen devotes the remainder of her life to just laying eggs and does not leave the nest again. 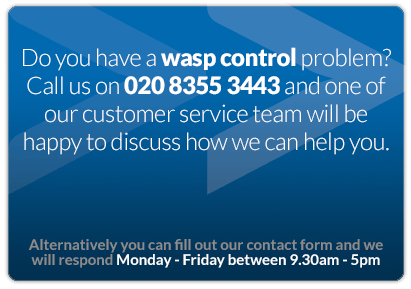 It is imperative that if you see any signs of a wasp control problem that you act quickly to eradicate this before it becomes a major problem. The nest grows to a size somewhere between a football and a beach ball and can contain up to 50,000 individuals by the end of the season. Each worker tends to carry out a given task, such as nest building or feeding larvae, for a given day, but may change tasks if the need arises. In autumn, larger cells are constructed for the crop of new queens and larvae in these cells receive more food than those in normal cells. At the same time, the queen begins to lay unfertilized eggs in different cells that develop into males. After emergence, the new queens mate and then seek shelter for the winter. The old founder queen, workers and males all die off. Wasp stings can be very painful and occasionally lethal. If you go too close to an active wasp nest then you will be mobbed and stung by many wasps at the same time. 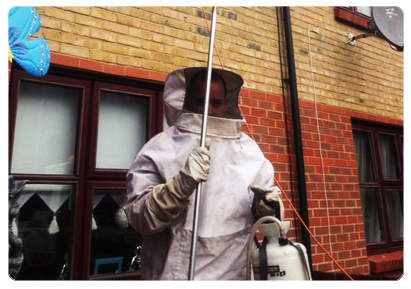 A professional wasp control pest technician from Beaver Pest Control should be employed as our staff have the experience and correct protective clothing. 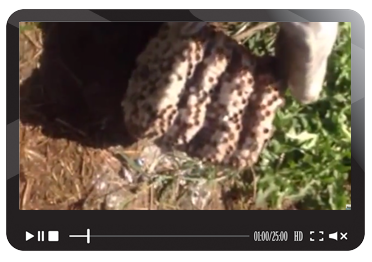 We will usually treat the heart of the nest, or the entrance they are flying into, with an insecticidal powder applied with a special applicator. 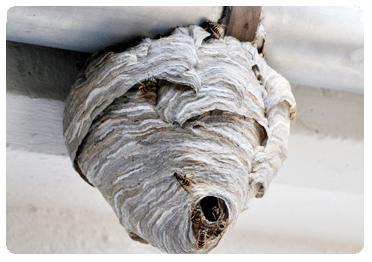 The entire nest will normally die off within a few hours but if it has not worked after 48 hours then you can phone us and we will return free of charge to complete the wasp control job. 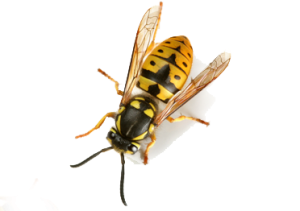 Hornets are larger than wasps and instead of the distinctive black and yellow colouration they are more brown and yellow. Their life cycle, behaviour and stings are similar to wasps and the wasp control treatment is the same. 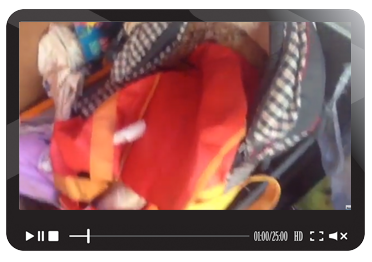 Wasp Control videos to emphasise the importance of early action.